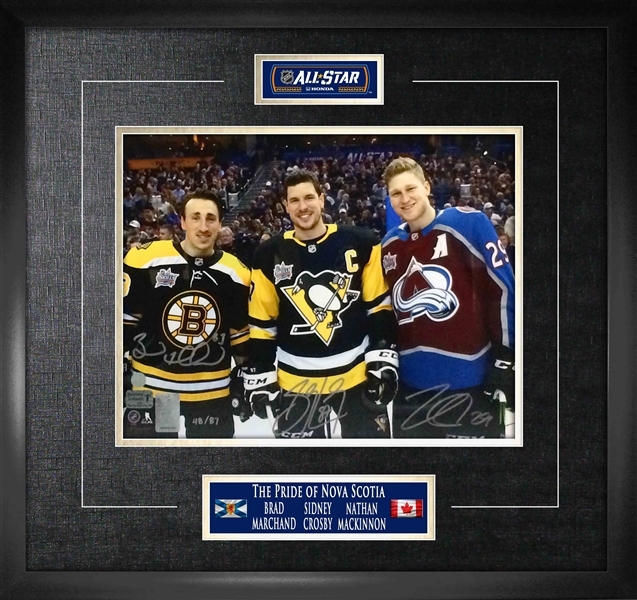 This limited edition 90/100, 11x14 framed photo has been personally multi-signed by All-Stars Sidney Crosby, Nathan Mackinnon and Brad Marchand. Nova Scotia was making a statement at the 2017 All-Star game having three players representing their teams in the 2017 game. The photo is framed with an etched mat of the official 2017 All-Star Game banner. During the skills competition, Crosby (Metro) won the skills challenge relay, and the DraftKings Accuracy Shooting. Mackinnon participated in hardest shot competition and the four line challenge but did not win an event. Marchand lost to Crosby in the relay, and participated in the four line challenge. Mackinnon went pointless in a loss to the Pacific in game 1 of the All-Star Game. Crosby had a goal and an assist during game 2 of the All-Star Game, and Marchand had an assist as the Metro won handily by a score of 10-3. The Metro division won in the finals by a score of 4-3. The Metro team split $1 million for winning the All-Star Game. This frame is accompanied with a hologram from Your Sports Memorabilia and Frameworth, and a Frameworth COA is included to ensure the authenticity of each autograph. Finished size: 22x22”.